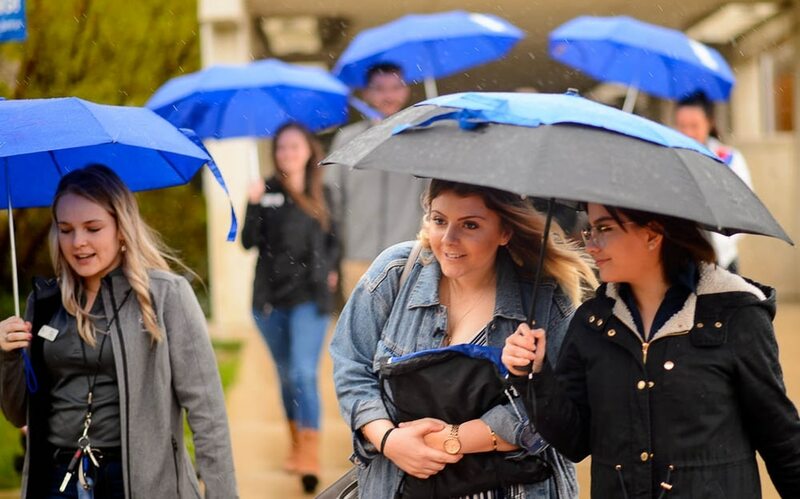 (Trent Nelson | The Salt Lake Tribune) Kaitlynn Lovelady, at center, on a tour of Salt Lake Community College in Taylorsville on Monday April 15, 2019. Lovelady accidentally applied to SLCC instead of a college in Louisiana, where she lives. The Utah school, though, isn't letting it go without a fight. They're taking her on a tour to try to convince her to come here anyway. From left are Alexa Anglin, Lovelady, and Valeria Ampuero. (Trent Nelson | The Salt Lake Tribune) Kaitlynn Lovelady, right, meets with Salote Brown-Halatoa in the admissions office during a tour of Salt Lake Community College in Taylorsville on Monday April 15, 2019. Lovelady accidentally applied to SLCC instead of a college in Louisiana, where she lives. The Utah school, though, isn't letting it go without a fight. They're taking her on a tour to try to convince her to come here anyway. At center is Brooke Miramon. (Trent Nelson | The Salt Lake Tribune) Kaitlynn Lovelady on a tour of Salt Lake Community College in Taylorsville on Monday April 15, 2019. Lovelady accidentally applied to SLCC instead of a college in Louisiana, where she lives. The Utah school, though, isn't letting it go without a fight. They're taking her on a tour to try to convince her to come here anyway. (Trent Nelson | The Salt Lake Tribune) Kaitlynn Lovelady, right, speaks with Provost Clifton Sanders while on a tour of Salt Lake Community College in Taylorsville on Monday April 15, 2019. Lovelady accidentally applied to SLCC instead of a college in Louisiana, where she lives. The Utah school, though, isn't letting it go without a fight. They're taking her on a tour to try to convince her to come here anyway. At center is Brooke Miramon. (Trent Nelson | The Salt Lake Tribune) Kaitlynn Lovelady on a tour of Salt Lake Community College in Taylorsville on Monday April 15, 2019. Lovelady accidentally applied to SLCC instead of a college in Louisiana, where she lives. The Utah school, though, isn't letting it go without a fight. They're taking her on a tour to try to convince her to come here anyway. (Trent Nelson | The Salt Lake Tribune) Kaitlynn Lovelady on a tour of Salt Lake Community College in Taylorsville on Monday April 15, 2019. Lovelady accidentally applied to SLCC instead of a college in Louisiana, where she lives. The Utah school, though, isn't letting it go without a fight. They're taking her on a tour to try to convince her to come here anyway. On Monday, the Louisiana native got her answer firsthand during an all-expenses-paid trip to Utah and a guided tour of the campus by top administrators. She walked through the library, the financial aid office and the basketball arena in Taylorsville. A pack of reporters followed closely behind. “You’re kind of like a celebrity here,” said Ryker Low, 19, a SLCC student ambassador. The identification still makes her laugh. Lovelady had been sitting in front of her laptop in February, admittedly a little bored, when she typed “business classes SLCC” into Google. She clicked on the first link and applied. Lovelady, already a senior in business management at the University of Louisiana at Lafayette, had wanted to to save money by finishing a few credits over the summer at her local community college — that is, South Louisiana Community College. When she realized the mistaken acronym, she posted about it on Twitter. And it quickly took off. “I just applied to SLCC for summer class only to realize it’s Salt Lake Community College in SALT LAKE CITY, UTAH instead of SOUTH LOUISIANA COMMUNITY COLLEGE. GOODBYE $40!!!!!!!!!!!!! !” she wrote. The Utah school said they’d refund her application fee — because apparently the mixup happens often — but some residents here had a little fun with it first. Lt. Gov. Spencer Cox responded that it “might be the best $40 you’ve ever spent.” One woman said, “try Cafe Rio pork and any second guesses you have will disappear.” Others mentioned skiing and fry sauce and the Jazz. Meanwhile, the SLCC in Louisiana teased “it’s so much warmer here” and “#KeepKaitlynnInLA” trended on social media. Lovelady, who plans to graduate in fall 2020, hasn’t decided where she’ll go yet. But having the chance to walk around Utah and SLCC’s campus in the rain on Monday did a bit to sway her, she said. She landed in Utah on Friday and ended her trip Monday with the campus tour. In between, she went to the state Capitol, ate a shake “bigger than my head” at Iceberg, walked around Temple Square downtown, saw snow and mountains for the first time at Alta Ski Resort and visited Antelope Island. (Photo courtesy of Kaitlynn Lovelady) Kaitlynn Lovelady and her friend, Brooke Miramon, visited Utah in April and both saw sn... (Photo courtesy of Kaitlynn Lovelady) Kaitlynn Lovelady visited Utah in April for a tour of Salt Lake Community College. (Photo courtesy of Kaitlynn Lovelady) Kaitlynn Lovelady and her friend, Brooke Miramon, visited Utah in April and tried shake... (Photo courtesy of Kaitlynn Lovelady) Kaitlynn Lovelady visited Utah in April and toured Temple Square. (Photo courtesy of Kaitlynn Lovelady) Kaitlynn Lovelady and her friend, Brooke Miramon, visited Utah in April and both saw snow for the first time. (Photo courtesy of Kaitlynn Lovelady) Kaitlynn Lovelady visited Utah in April for a tour of Salt Lake Community College. (Photo courtesy of Kaitlynn Lovelady) Kaitlynn Lovelady and her friend, Brooke Miramon, visited Utah in April and tried shakes at Iceberg. (Photo courtesy of Kaitlynn Lovelady) Kaitlynn Lovelady visited Utah in April and toured Temple Square. He couldn’t help pressing Lovelady on how she got through her the college application, though, without realizing which state it was in. “What did you think about the questions asking if you’re a Utah native?” he asked. “Well, there are a lot of blondes in Utah,” comforted Provost Clifton Sanders, who met with the student as part of her tour. He showed her his collection of saxophone paintings in his office and tried to convince her to sign up for classes. Overall, though, the school’s staff has said they’re just glad she’s pursuing an education — whether here or in Louisiana. “It was cool to see the whole community rally behind her,” said Sarah Reale, who first responded to Lovelady on Twitter and who helped arrange the tour Monday. If Lovelady came to the SLCC in Utah, she’d pay about $6,000 in tuition per semester as an out-of-state student. That’s about how much she’s already paying at the University of Louisiana. 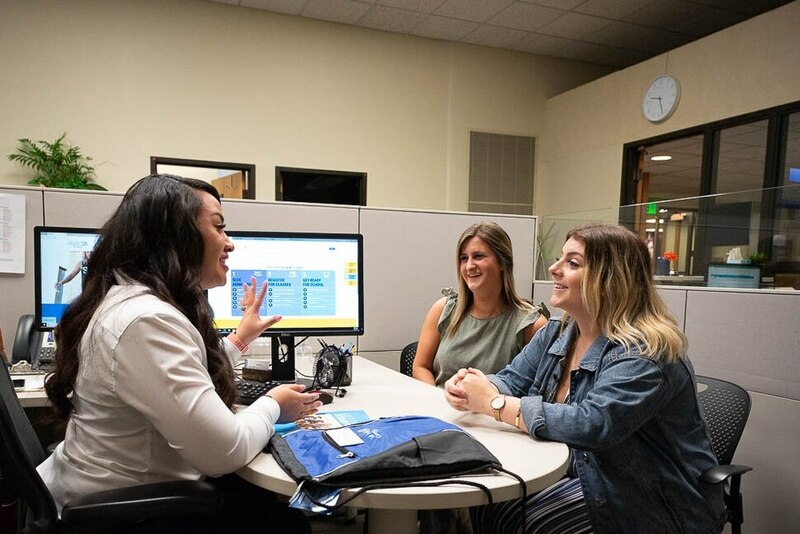 Salt Lake Community College admissions advisor Salote Brown-Halatoa walked her through the different financial aid packages and scholarships — and about how she could take classes online wherever she wants. And the textbooks are cheaper. Lovelady spends about $4,000 on books per semester. Most students at SLCC in Utah don’t spend more than $300 because the school rents them out at the library and scans them so they’re available online. Lovelady’s friend turned to her. “So why’d you go to Utah?” Miramon said as a joke. 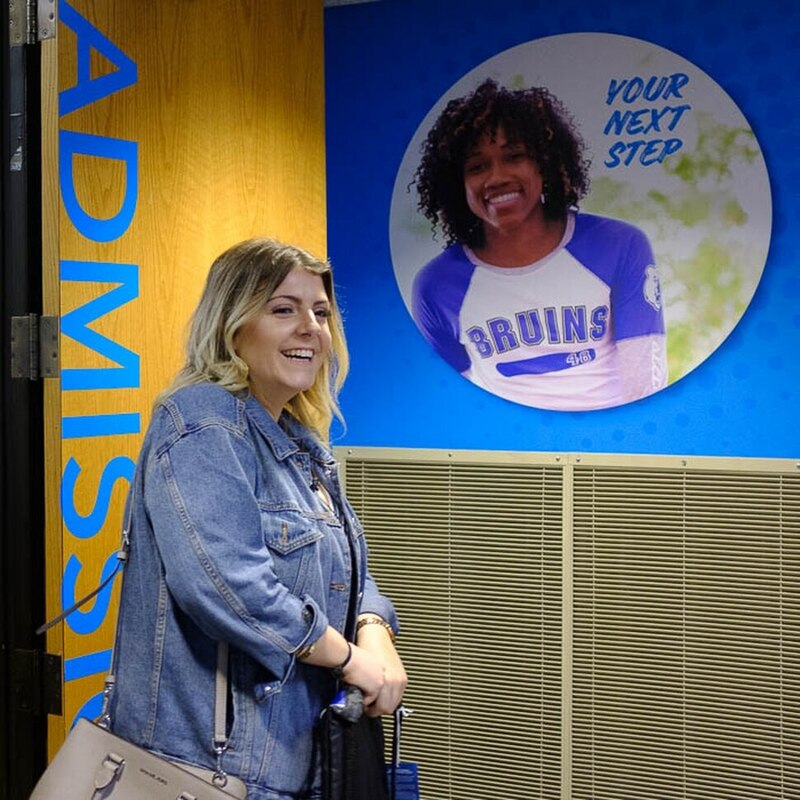 She met with the school’s student body leaders, had a private meeting with the business department’s advisor, got a list of the best places to find free food on campus, wore a SLCC backpack and cheered when she heard about the $10 massages offered at the campus’ health center. She also asked about the school’s bear mascot, which hung on the walls of nearly every building they went in. “We don’t have one,” Lovelady said about her current school. “Yes, we do. It’s a cayenne pepper,” Miramon corrected. “I tweeted it to give everyone a laugh,” she noted. “But it was a good mistake. Now I know there are other opportunities for me."